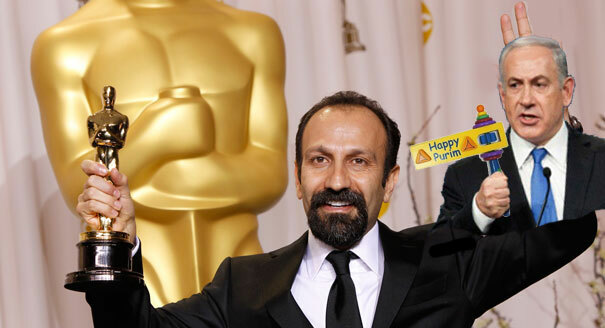 Iran beat Israel in the Foreign Language category at the Oscars this month, but Israeli Prime Minister Benjamin Netanyahu reminded the Iranians what happened in Iran (née Persia/Shushan) at the end of the Purim story when Haman thought he was a big winner too. In other Academy Awards news, Sacha Baron Cohen's wife Isla Fisher is reportedly upset that her husband took pancake mix out of the couple's pantry without asking her first. Baron Cohen, as his character from the movie The Dictator, threw the pancake mix at Ryan Seacrest claiming it was the late Kim Jong Il's ashes. In an odd twist of fate, Baron Cohen is now sleeping on Seacrest's couch (and making him pancakes for breakfast each morning). 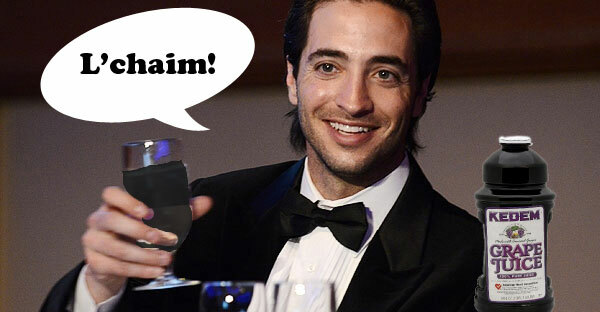 Ryan Braun claims the whole juicing allegation was just a Shabbat Kiddush misunderstanding. The Milwaukee Brewers all-star admits that he was juicing, but only because he was asked to say the blessing at his cousin's bar mitzvah. 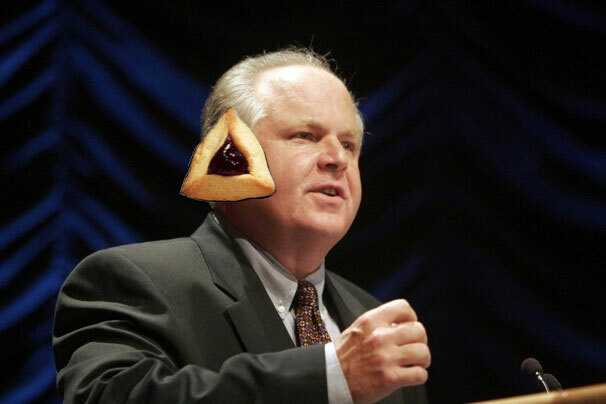 Right-wing radio talk show host Rush Limbaugh mistakenly thought that Jews were overwhelmingly supporting him after he heard loud singing emanating from a local synagogue on the Purim holiday: "Hava Narisha Rush Rush Rush!!" he heard them singing enthusiastically. For Jewish people who already enjoy Trump hotels, Trump golf courses, Trump reality TV shows, and Trump beauty pageants, you can now enjoy the Trump brand when it comes to Jewish holidays too. 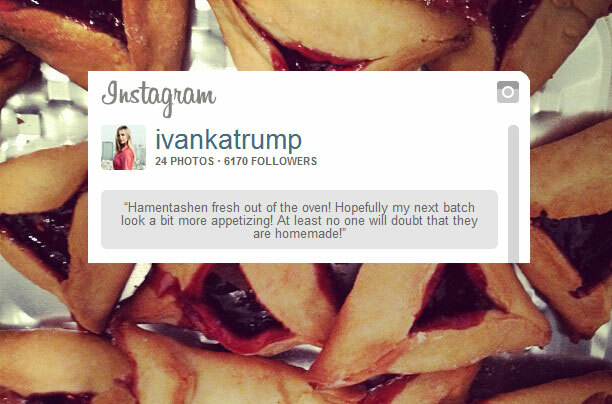 The Donald's daughter Ivanka Trump, who converted to Judaism, recently tweeted her own hamantashen recipe along with photos of her delicious looking triangular pastries. 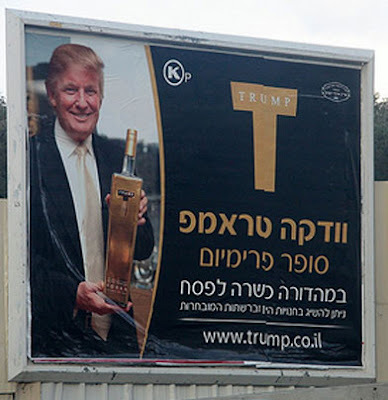 And if you need a drink to wash those hamantashen down, there's always the Donald Trump brand vodka, which will now be kosher for Passover! No word yet on what Trump is planning for Shavuot ("Billionaire Blintzes" perhaps? ).